Your triceps surae is more commonly known as your calf. It is actually composed of two muscles, the gastrocnemius and the soleus. These muscles connect the back of your foot to the back of your upper leg. They are necessary for movements integral to soccer, such as running and kicking. 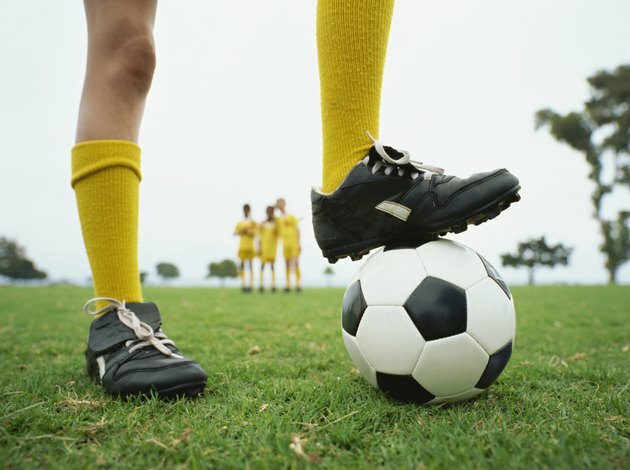 Your calf muscles may occasionally develop sudden and involuntary contractions called cramps during soccer games. If you experience cramping in your calves, your muscles will contract suddenly and may go into spasms. This will cause sharp and sometimes even excruciating pain in your muscles. You may also be able to feel or see a hard, contracted section of muscle tissue protruding from your lower leg. While your muscles are cramped, you will be momentarily unable to move the section of your body they control and unable to relax your muscles. Calf cramps usually occur when your muscles are overused, tired, dehydrated or strained. Soccer players often overuse their muscles with the amount of running they do during games. According to SeriousRunning.com, the average soccer player runs more than six miles each game. Especially if it is hot outside and you are not drinking an adequate amount of water, this may be enough to stress the muscles in your legs and cause cramps. When your muscles start to cramp, you can take some simple steps to alleviate the cramping and pain. Massage your cramped calf muscles by rubbing them deeply with your fingers. Stretch your calf by bending over and pulling your toes back toward you. In addition to massage and stretching, applying hot or cold packs to your cramped muscle will help. A warm pack will relieve muscle pain after your cramp, while a cold pack will help relax a muscle that is currently cramped. You can take a few preventative measures to prevent your legs from cramping, even if you are pushing your muscles in soccer games. Drink plenty of water before, during and after you games so that you remain hydrated. Dehydration can lead to cramps, and keeping your muscles hydrated will help them contract and relax normally. In addition to water, consume enough electrolytes, such as salt and potassium through sports drinks, vitamins or your diet. Finally, stretch your calves before and after games to keep your muscles elongated. Some health conditions are known to cause muscle cramps, such as anemia and diabetes, as well as nerve and kidney disorders. If you experience calf cramps often, even when you are hydrated and not performing strenuous exercise, you should go get checked out by your physician.